The Solar Flashlight comes charged and ready to go right out of the box. To put a full charge on the light after it runs down, simply lay it outside or in a window facing the sun. It takes 10 hours to fully charge the light, but with that the light with shine for around 12 hours before needing another charge. Featuring 6 bright white L.E.D. lights, the flashlight conserves power and shines bright. This model has an upgraded battery, which holds more charge and will shine longer. 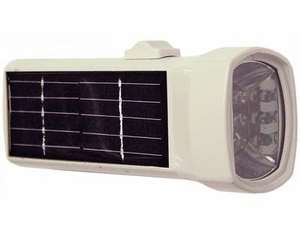 Most solar lights on the market only hold a charge for 4 hours. This light holds 3X the charging length.